The smallest folding knife in Gerber's Pararframe range, the Paraframe Mini is the perfect knife for everyday use either in the home or out in the wilderness. The high carbon, clip point, steel blade is immune to corrosion and is available with either straight cutting edge or a semi straight serrated combo depending on your particular needs. The skeleton style handle of the Paraframe is made from stainless steel to give it the same corrosion protection as the blade but also to ensure great strength and a long working life coupled with the knifes lightweight. 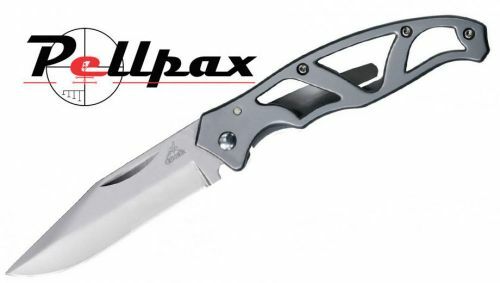 The built in clip ensures this knife is always to hand when you need it most. To learn more about Gerber, check out our Brand Focus blog on the company. And learn more about the Gerber brand on their collections page.